Backyard egg production is one of the oldest farming activities not only in the U.S. but also around the world. Indeed, during my childhood in the mountains of Honduras, I used to feed kitchen leftovers and whole corn to our layer hens. Since we did not have a chicken coop, the hens slept in a tree in the back of our house. I vividly remember stalking the chickens into the bushes to find the treasure, a nest of eggs. Regardless of the living location (urban, suburban, and rural areas), there are more people today willing to keep birds in their backyard. In the rural areas, there has been more interest in growing the feed ingredients (corn, wheat, soybeans, etc.) and produce layer feed at home. But, do you know the essential considerations when producing layer feed at home to have a healthy flock and get the most eggs from your layer hens? Feed quality and adequate nutrition are important at all stages of pullet/layer development. Regardless of the age, layers require a balanced diet that contains all the essential nutrients (vitamins, minerals, proteins, carbohydrates, fats, and the most forgotten nutrient— water) in order to sustain egg production over time. Nutrient deficiencies or excesses can negatively influence pullet growth and layer egg production. Furthermore, pullet and layer feeds are typically intended to be fed as a sole source of nutrients, so any nutrient deficiencies or toxicities can negatively affect their performance and health. In addition, nutrient requirements change depending on the age of your hen and if she is molting or laying. For example, compared to growing pullets, layers have higher calcium requirements to produce the shell. Therefore, a laying hen diet should contain different calcium sources such as oyster shell or coarse limestone. Typically, a laying hen consumes approximately 1.75 lb. of feed each week, or approximately 113 grams of feed per day. Plan in advance the amount of feed that needs to be produced depending of the number of layers. The first step to produce high-quality feed is to start with high-quality ingredients. Cereal grains are good sources of energy, while protein meals are good sources of protein and essential amino acids. The amino acid makeup of corn and soybean meal complement each other very well. This is one of the reasons why a corn-soybean diet supplemented with vitamins and mineral premix provides the nutrients required for growth and egg production. To grow your own chicken feed, you need to know what you are getting yourself into with regard to time, cost, space, and yield. Not all pieces of land require the same amount of work to prepare, so costs will vary depending on the needs of your soil. (We have not included those costs.) Additionally, it will take you about a day to work the soil for corn and the same for soybeans, keeping in mind that they are usually planted at different times of the year. So that also means that you tend to harvest the grains at different times of the year. So how will you plan on storing the grain in order to prevent mold from high moisture as well as keep rodents and insects at bay? For some of you, this already takes you out of your depth, but let’s keep going. Corn and soybeans seeds cost money and they average about $20 for a five-pound bag of corn for animal feed (do not use sweet corn as it is the wrong type) and soybeans are $3.95 for one pound. The yield you get on any particular plot of ground depends on a lot of different factors. Are you watering the corn or letting mother nature do that work? How close did you plant the rows and what is the plant spacing? What disease or insect pressures are present in your area? Are you spraying herbicides or hand weeding? In our calculations (see sidebar “Do the Math to Feed One Chicken”) we estimated that your corn yield would be below the national average but the soybean yield would be the same as the national average. 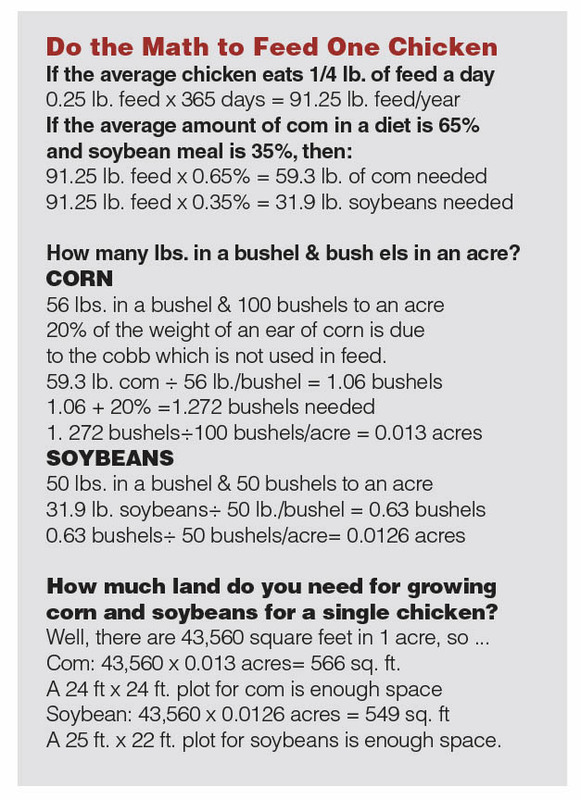 So if you have enough land and time to plant, maintain, harvest, and store corn for one chicken then you will need a plot that is approximately 24 feet by 24 feet. And for soybeans you will need 25 feet by 22 feet. These calculations are just for the two main ingredients in your chicken feed. There are other ingredients like fat, vitamins, and minerals that you will need to store until it is time to be used. An extension poultry nutritionist can help you if you want to spend time to do the calculations for your own feed mixture. Our calculations are for just one chicken, so you need to multiply our numbers for the size of the flock that you maintain. And of course you would not want to mix your feed up for a whole year all at once because your vitamins would go rancid after 3 months or so, depending on how you store your final product. You would need to mix up your feeds periodically and store them in a manner that kept mice and insects out and kept mold from forming. Are you feeling a bit like a feed mill or feed store manager yet? These are all things that they must think of when moving inventory out the door or deciding when to mix and store feeds or their ingredients. They don’t call it poultry science for nothin’! Most of the ingredients used in animal feeds have “anti-nutritional” factors that can affect growth, egg production, and health. Therefore, when selecting your ingredients, you should know the anti-nutritional factors associated with those ingredients. Raw soybeans, for example, contain high levels of anti-nutritional factors such as trypsin inhibitors, which must be inactivated by proper heat treatment. These anti-nutritional factors can reduce nutrient absorption and compromise the health of the laying hens. Trypsin inhibitors can be inactivated by adequate heat treatments such as cooking, boiling, microwaving and roasting. According to poultry research, trypsin inhibitor activity can be inactivated by boiling soybeans at 100°C for 9 minutes, roasting for 2 minutes, cooking for 7 to 30 minutes, microwaving for 3 minutes, and autoclaving at 121 °C for 15 minutes. The heating conditions are important as they influence the quality of the soybeans and its nutritional value. Although laying hens appear to be less sensitive to trypsin inhibitors, it is necessary to heat all the soybeans regardless of the purpose. In comparison to soybeans, corn has fewer anti-nutritional factors. However, the moisture content of corn should be around 14.5% to reduce its likelihood for mold growth and mycotoxin production. First, corn must be shelled and ground before being mixed with the other ingredients: protein meals, vitamin premix, mineral premix, and vegetable oils or animal fats. Grinding is important to increase the surface area, which increases its digestibility, improves its ability to mix evenly with other ingredients, and reduces segregation after mixing. Coarse grinding (Figure 1) is important to maintain the overall health of the laying hens. Coarse grinding stimulates gizzard development and creates a more acidic environment in both the proventriculus and gizzard, which helps to inactivate pathogenic bacteria such as Salmonella before entering the small intestine. In addition, coarse grinding will reduce grinding costs. Coarse grinding can be obtained by using a screen with larger holes. Corn shellers are available at a variety of prices ranges from $45 to $330. A grain mill that can be used in the kitchen or garage can range from $120 to almost $500. Shelling your corn, baking your soybeans, cracking the grain, and mixing the feed can all be done in a day. Once the corn and soybeans are ground, the next step is to mix them. Prior to mixing, individual ingredients must be weighed using a scale with an accuracy of 0.1 pound. The main objective of mixing is to produce a high-quality layer feed in which nutrients are uniformly distributed. A countertop mixer, like you use for mixing up cake batter, can be used to mix layer feeds. The major ingredients (corn and ground soybeans) must be added first, followed by the minor ingredients (calcium carbonate, phosphorus, salt) and finally vitamins and/or mineral premixes. Once the dry ingredients are in the mixer, you should mix ingredients for 3 minutes to make sure the dry ingredients are distributed uniformly in the batch. After the dry cycle, liquids (animal fats or vegetable oils) should be added slowly into the mixer to prevent the formation of fat balls as they negatively affect mixing uniformity. After adding the liquids, you should mix for 5 minutes to ensure uniform distribution of liquid ingredients. Figure 2 illustrates, poor, medium, and good mixing uniformity of feeds. These pictures can serve as a comparison tools to measure the quality of your mixed feeds. You can then pelletize your feeds, which is known to be a way to decrease waste by the birds. You need a device that heats up the ingredients to the point that the lignin binds the pellet. There are cheap products that look like they do the trick but they do not. We are talking about a device with a die that spins around and pushes ingredients through a screen. This most affordable one I could find in the Americas was at least $1,225 from Pelletmasters, but I will encourage you to look on your own. Once you have pellets, then you can send it back through a grain mill on the coarsest setting to break the pellets down into crumbles for chicks or growing birds. So now you have the details. What do you think? Are you an intrepid adventurer ready to take on this project next year? Yes, you heard me right. I said next year. That is because planting season is long past for both of these main ingredients found in chicken feed. Take the time now to do your research. Take a couple classes or go to some seminars through your county cooperative extension office. Learn a thing or two about growing corn or soybeans and you may find that you appreciate the work that goes into that bag of feed that you just loaded into your vehicle. I hope you now understand what it really takes to get those first two ingredients into the feed you put in front of your chickens.